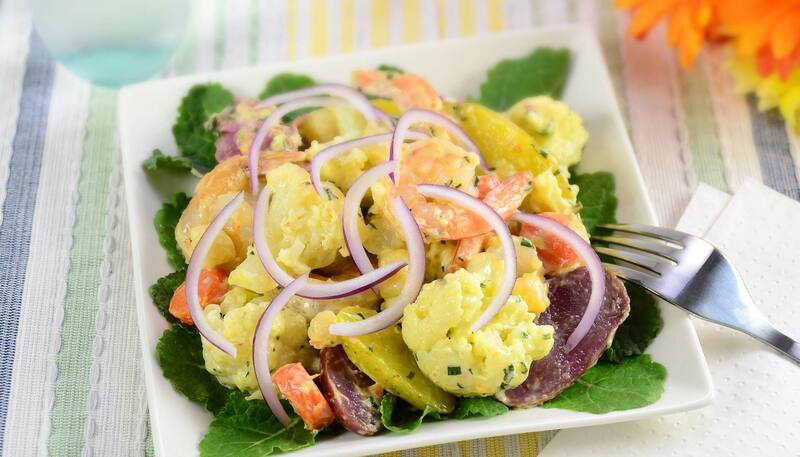 Steamed potatoes, cauliflower, shrimp and scallops are tossed in garlic and mayo based dressing. It is fast and satisfying, perfect for a weekday meal! Cut potatoes in halves, lengthwise. Sprinkle salt and pepper and toss in a bowl. Peel carrot and cut into 1/4 inch thick slices. Cut cauliflower into bite-sized florets. 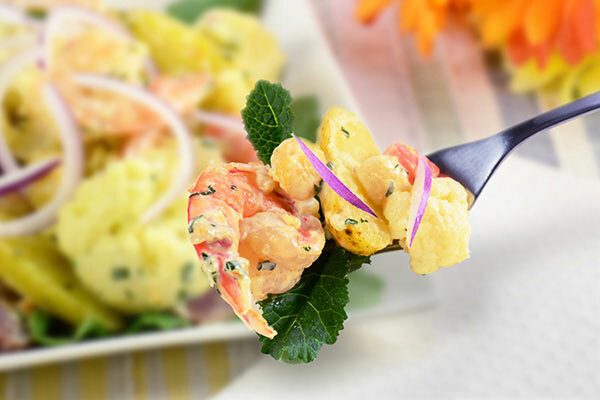 Peel and devein shrimps. 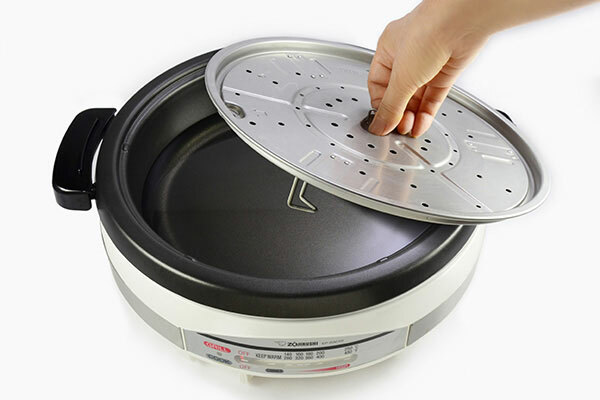 Add 5 cups of water (not in the ingredient list) to the deep pan of your Gourmet d'Expert® Electric Skillet (EP-RAC50), and place the steaming plate inside with its legs at the HIGH position. Line parchment paper on the steaming plate. 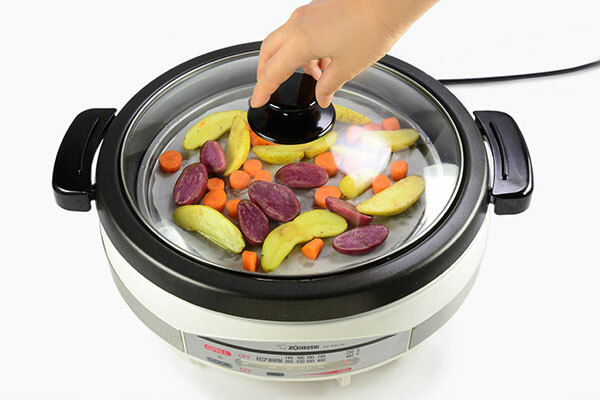 Place seasoned potatoes and sliced carrots on the lined steaming plate and cover with lid. Turn the control lever to HIGH. Once it reaches a boil (or when steam begins to rise from the gap between the pan and the lid), steam for 8 minutes. Reduce heat to 360ºF. 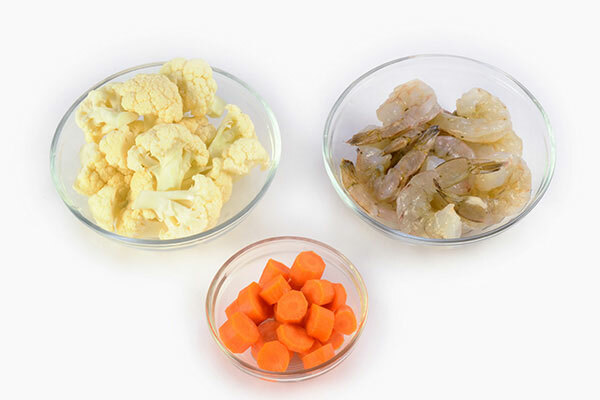 Open the lid, add cauliflower, shrimp and scallops. Then cover with lid and allow to steam for another 5 minutes. Be careful of the hot steam. While steaming, prepare dressing and topping. Mince basil leaves and place in a large bowl. 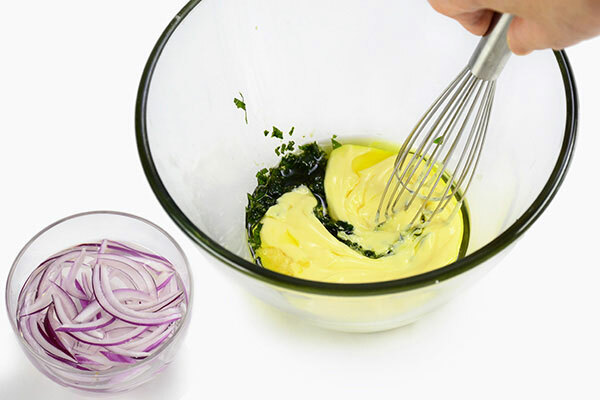 Add mayonnaise, garlic, olive oil, salt, lemon juice and mix well. 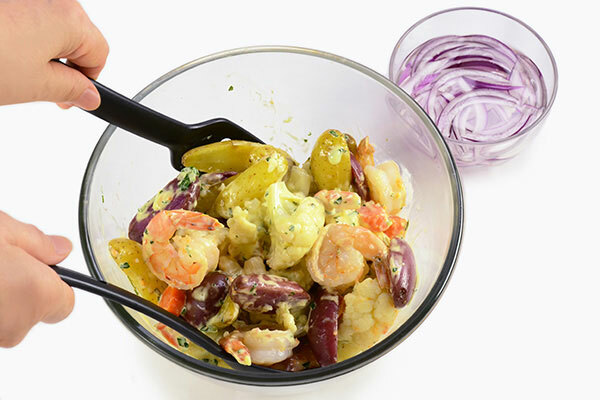 Thinly slice the red onion, and soak in a small bowl of water, and set aside. 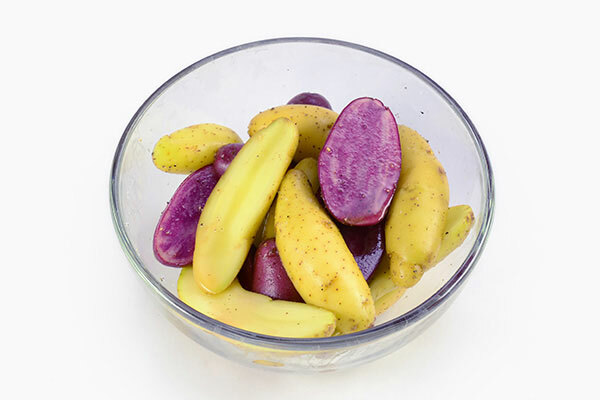 Insert a toothpick into the center of a few potatoes to check doneness. Be careful of the hot steam. 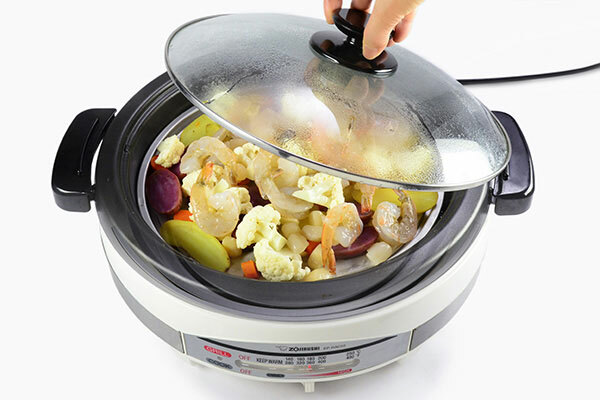 When the ingredients are done steaming, turn the control lever to OFF. 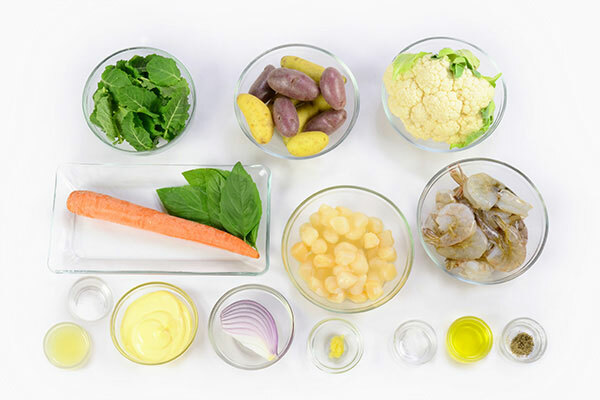 Transfer steamed ingredients to a large bowl, and toss with dressing from step 6. Line serving dish with baby kale leaves and serve salad over. 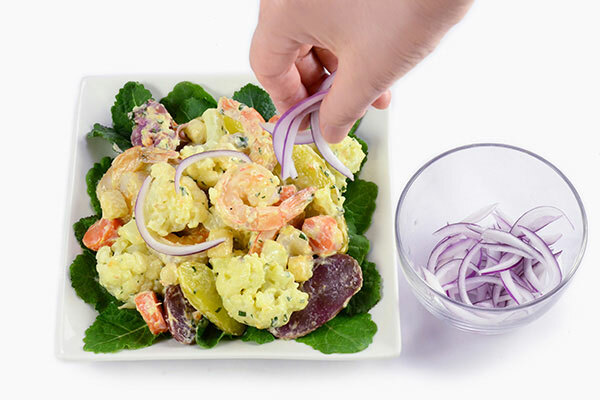 Drain red onion slices and scatter on top of the salad.